week. My response was none other than, HELL YEAH! Not only was the event a blast, but so was the time surrounding the event with family and friends. This being my first marathon, a question I was often responding to was, “have you always been a runner” or “did running just come easy to you?” So during the dreaded last week of the taper I really had the opportunity to reflect upon my “road to the marathon” journey. It was anything but an easy road, full of setbacks and frustrations (mostly blisters…… lots of blisters). But just like the day of the marathon itself, the key for me was two parts. First to keep putting one foot in front of the other when your head tells you you should stop, but most importantly to surround yourself with positive people in your life (which, are abundant in the running community). So in January of this year I had just turned 40 and was relatively fit, but not nearly as kind on the scale as I wanted to be. That coupled with the unfulfilled goal of running a half marathon that I had kinda sorta… maybe thought I would “try” (Side note, don’t do that. Say you are going to, and tell as many people you are as you can so you CAN’T back out. It works) to run, I decided I would start running a little after my class at the gym. I stood on the treadmill and found all the reasons to procrastinate that I could and finally started out at 5.5 miles an hour. I thought I could hold this for at least a mile right? I hung on for dear life at this pace for a minute and then grabbed for the controls to slow it to a walking pace. For the next few weeks I continued on this track while gradually trying to run for longer durations each time. Fortunately, I had already agreed to run a 10k the first part of February, so I had to stick with it. Since being able to get off the couch and then finally off that treadmill when the weather finally opened up the trails, I was able to run a number of firsts for me. I knocked off a 5k, 10k, and my original goal for running, the Squaw Valley Half Marathon in June. This was supposed to be the end of my story right? Well, unfortunately I started to actually enjoy running and the friends I had gained through running. So I continued to run every Thursday with the Salomon Run Club Tahoe and fun runs with friends. 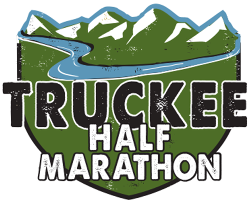 In about June or July I was asked if I would want to help be in a video shoot for the Truckee Marathon. I figured, why not right? If nothing else, I could get a TON of mileage out of claiming to “be a model”. So some friends from the gym and I met the crew of Big Blue Adventures and spent part of a morning shooting some rad video for this upcoming event. It was great to get to know them as well as more about the marathon itself. And we were shooting in some really cool spots. It got me to start to think about…. Maybe one day…… Nah, I just started running. I couldn’t run a marathon in my first year… or could I? Fast forward a month or two later and I found myself starting to talk about, maybe running the Truckee Marathon, or at least the half. Then I started to study the course map to figure out where the race would be going, which lead to a couple test runs up Northwoods Boulevard to see if that was going to kill me. Suddenly as the weeks went on and I heard that my friends that I had really bonded with from the Squaw Valley Half Marathon (and subsequent trail runs) were signed up, I pulled the plug and registered to run. For me this was a huge shift of my training mindset. I started to tailor my runs to the course (and my runs were often course segments). As the race day started getting closer and closer, all I could talk about was running. I was amazed at how helpful many of my friends who are experienced athletes were with providing advice on race strategy, diet, hydration, mental preparation, and my favorite the funny stories of lessons learned. And the beauty of it, I was able to incorporate training runs into many of these brain dump sessions. Which was perfect, they could talk while I was sucking wind! It was on one of these runs that I mentioned to my dear friend Adam (who know holds the course record for the Truckee Marathon by the way. Proud of you buddy!) that I had been wanting to invite my family to come see the race, but had my reservations. What if I failed? What if I had a bad day and couldn’t finish the race? Would it be too much pressure knowing that they were there waiting for me? He told me that there is something really cool about having people there for you and that I shouldn’t not invite them because I might not finish. That wasn’t a good enough reason! Adam couldn’t have been more right. The day of the race, my nerves were getting the best of me. I started out the race running with my friends Karen and Mark and had my heart rate alarm blowing up. I just couldn’t seem to calm down even though I knew the course and had a steady pace. So I held back further trying to get that under control (which didn’t help the nerves any either). So as I rounded the west end of Donner Lake and not really pleased with how the race is starting for me, I see my mom, dad, aunt, and two amazing friends at a distance and cheering me on. My head picked up and so did my pace. Adam was right, you can’t fully describe what that will do for you on race day. But if you ever get a chance, be THAT for someone else! So I continued on the course and was running with my friends again at this point. The Truckee Marathon course is really great for having spots that those that want to cheer you on can easily get to. I got to see “my crew” again at Northwoods, Glenshire Drive (where I really needed another pick me up at Mile 20), and of course the finish line. The race course itself is really fun and provides enough variety and epic scenery to make the, in my case 4 hours and 40 minutes, really enjoyable. The race crew and volunteers were great all through the event. I particularly enjoyed the trail segments that helped to break up any real lengthy segments of pavement. And did I mention the views…. Pictures seriously don’t do it justice! As a first timer to the marathon scene, I can assure you that after this experience it won’t be my last! I just want to say thank you to Big Blue Adventures for putting on two fine events that will always hold a place in my heart as my first races. And for anyone “thinking about running”. Don’t think, do it! Say you are going to do it, sign up for the event, and tell everyone you know you are running it (Can’t back out now). That will be the driver for you to train like hell so that you can have a blast on race day. Race day wasn’t easy, but the good things in life never are. But I can tell you that my first marathon not only gave me a huge sense of accomplishment that I will never forget, but also provided an experience that I was able to share with my family and friends that will forever strengthen our relationships. Truckee Marathon 2017 was, without a doubt, one of the BEST days of my life!